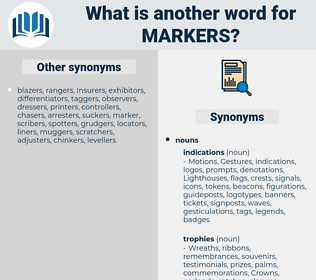 What is another word for markers? 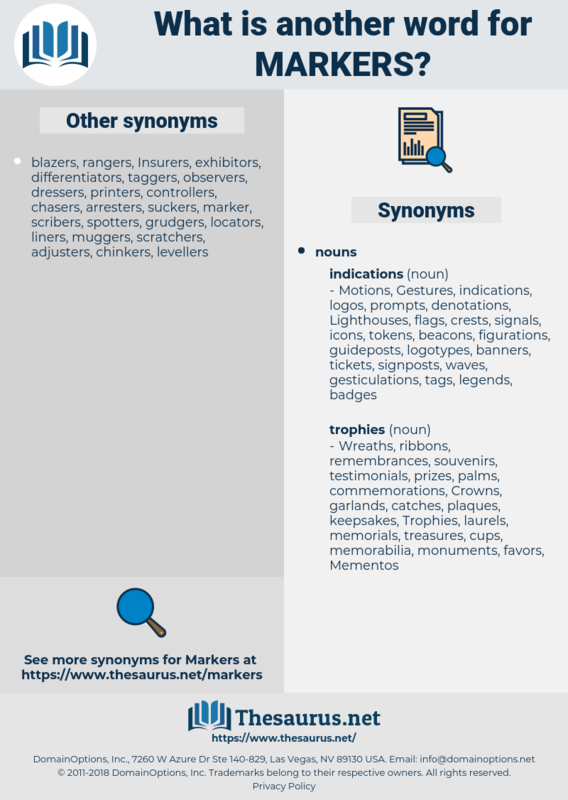 BIOMARKERS, highlighters, milestones, hallmarks, tags, bookmarks. makers, marks, markings, Microsatellites, manifestations, kilometers, parameters, proofreaders, identifiers, Trademarks, breakthroughs, Marques, Marcas, designators, tracers, placeholders, bench-marks, examiners, timestamps, trade-marks, banners, plaques, Measurements, scoreboards, markups, inscriptions, informers, boulders, techniques, terminals, indications, allozymes, specifications, stamps, reviewers, placards, pointers, bearings, cornerstones, endorsements, probes, targets, weightings, liabilities, repeats, perpetrators, stakes, yardsticks, informants, steps, Fingerprints, Emblems, signal, signals, predictors, pillars, trails, Tracks, reference, references, expressions, baselines, Guidelines, evaluators, Miles, decals, holders, signposts, particulars, responsible, constraints, Correcting, NORMES, phrases, trappings, PATHWAYS, subscripts, watersheds, Tests, safeguards, tenders, impressions, raters, features, metrics, avenues, directions, Scars, gates, indictors, giveaways, limits, Boundaries, Standards, buoys, symptoms, RAPDS, trims, imprints, Gems, slabs, norms, clues, endpoints, thumbnails, chart, guideposts, grand, leads, tokens, Cues, prompts, plates, wordings, bushings, timelines, hydrants, scores, mosaics, clicks, Entries, footprints, bollards, kiosks, Paths, SSRS, guides, poles, footsteps, ratios, positions, points, logos, ratings, anchors, Stations, Foundations, pierres, shapes, arrays, blocks, brands, Patches, shields, divisions, cones, rocks, Criteria, spots, Indexes, sheets, results, Stones, runways, approaches, Proxies, slides, prints, Vendors, bounds, pistes, inputs, Ticks, tips, hints, Pens, LEDS, benchmarks, fixes, posts, table, bids, insights, debts, editors, strips, felt, felts, Lights, casts, runs, indicators, registers, indicateurs, LINEs, Indices. landmarks, beacons, traces, labels, gauges. He told of Captain Kidd finding it and bringing it home, of the two children burying it in play and the storm sweeping away every trace of the markers. In this note - book I am making a list of all the nice Mount Markers. marsh hare, merger, marcher, memoriser, markhoor, memorizer, Moira Shearer, myricaria, Marie Curie, mercury, Marasca Cherry, marsh harrier, myrciaria, mineworker, Morris chair, mercer, mercouri, markhor.